Cleaning diesel engine crankcases of all kinds is a common application for StingRay Parts Washers. StingRay Heavy-Duty Parts Washer configurations are available for all railroad diesel engine applications including repair, maintenance, overhaul, rebuild and renovation of different parts and components of locomotives. 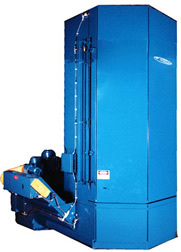 A StingRay parts washer configuration is capable of removing carbon, paint, gasket material, oil and grease from crankcases, pistons, connecting rods,& cylinder heads and cylinder liners, turbo parts, blowers gear case covers and traction motors. High power density and the power wash process clean to standards not possible with jet spray washing used in other washing equipment. Our heavy-duty systems are used in many 24/7 applications and withstand the rigors common in the rail industry. Systems designs capable of 60,000 pound loads and with a 170 inch work height handle the largest crankcases and blocks. Large machine designs are shipped in two pieces with quick disconnects and mating flanges for easy reassembly in the field. All machines are fully assembled and tested at the factory prior to shipment. StingRay diesel engine block wash machines work in new locomotive and engine remanufacturing. They consistently meet the most stringent customer expectations, exacting OEM specifications and ARR requirements to ensure reliability and durability of your finished reconditioned diesel engine components. Crankcase Bearing Journals Before & After washing. "Click image for zoom." The Stingray Industrial Parts Washer is ideal for prewash and teardown cleaning prior to inspection and reassembly. Parts are clean, dry and rust protected when they exit the machine. Crankcase oil galleries and the sludge coated interior of the engine are consistently as clean as outer surfaces. The StingRay crankcase washer cleans a 20 cylinder EMD engine crankcase. The 170 HP pump system and Power Kleen I detergent operating at 180 degrees, easily removes oil, paint and other contaminants assuring our customers quality restored and remanufactured EMD diesel engines and related equipment. Average cleaning cycle is less than 1 hour. Many Cat dealers are using this parts washer for the Long block program for Caterpillar 3204, 3304, 3306, 3520, C-175 and other engines. The StingRay 84112 parts washer is designed to clean large diesel engine blocks, locomotive crankcases, or other dirty large parts. StingRay Parts Washer offers a total aqueous cleaning soloution for large industrial applications. Learn more.